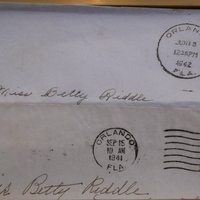 "Two envelopes, which were processed by the Downtown Orlando Post Office and addressed to Betty Riddle. The first envelope was stamped September 15, 1941, while the other envelope, sent nine months later, was stamped June 13, 1942. Riddle was a born and raised in Orlando in 1923 and would have been around 18 when these letters were sent. Riddle’s father, Robert Riddle, was the owner of the Eola Coffee Company on Lake Eola. Riddle married Carter C. Whitmire, Sr., who owned Whitmire’s Furniture Store. Riddle continued her involvement in Orlando as a member of many local clubs and organizations until her death in 2007. The most significant feature of these envelopes is that they both used 3 cent defense stamps as their postage. These stamps were issued in October of 1940 and contain a design sketched by President Franklin D. Roosevelt. These stamps were an attempt by FDR to encourage the United States to become involved in World War II. There were billions of these stamps sold across the U.S. in an effort to raise money for defense. Less than three months after the first envelope was stamped, the United States entered the war. Original envelopes to Betty Riddle: Orlando Remembered Exhibit, Downtown Orlando Post Office, Downtown Orlando, Florida. Digital reproduction of original envelopes to Betty Riddle. Rod, Steven J. "Arago: 3-cent Torch of Enlightenment." Arago: People, Postage, and the Post, August 4, 2015. Accessed September 19, 2015. http://arago.si.edu/category_2028701.html. "Betty Riddle Whitmire –Find a Grave Memorial." Find a Grave. Last modified October 17, 2012. Accessed November 9, 2015. http://www.findagrave.com/cgi-bin/fg.cgi?page=gr&GRid=99085322. “Envelopes to Betty Riddle.” RICHES of Central Florida accessed April 19, 2019, https://richesmi.cah.ucf.edu/omeka/items/show/5569.